Now comes the tricky part: finding the tree species that meet those criteria. Dr. Miyawaki recommends that you try to imagine what was growing at the site before people came into the picture and then plant those species. It would probably also be useful to visit a natural forest in the area to see what trees are growing there. Barring that, it would be good to have a list of the native tree species that are common to your area. Unfortunately, I don’t have the tree identification skills to come up with my own list. I also could not find a list of lowland forest trees found in Batangas. To come up with my list of trees, I started off with the list of “Indigenous forest trees recommended for habitat restoration/wildlife conservation with reproductive parts eaten by some animals based on field observations” from the Guide to Rainforestation Timber Species found at the Rainforestation Information Portal. There are 122 species in that list. I cross-referenced that list with the list of available native trees from Imelda Sarmiento of Hortica Filipina Foundation Inc. I also added species from Imelda’s list that were tagged as “wildlife, reforestation species”. I also took note of the trees that were used in the Yokohama tree planting at Clark, the trees mentioned in the book Philippine Native Trees 101 as food sources for animals or good pioneering trees, and the trees in the list of bird-friendly trees that we helped put together for our the Ecology Committee of our village. I also added the trees mentioned in a study of the trees of Mt. Maculot, the available trees in the Native Trees Nursery for Batangas mentioned in the Rainforestation Information Portal website. I also added Philippine Teak because I read that it is found in the lowland forest of Batangas. I am also trying to identify the trees that are already growing in the farm. I eventually plan to set up a nursery so I can gather the seeds and grow seedlings to add to the farm or for other reforestation projects. I am also planning to ask the our caretaker about the common trees in the area. I plant to show him the book Philippine Native Trees 101 to start. Hi Sylvia, I really admire what you are doing. You have quite a number of trees already. Make sure that you plant the fast growing ones (pioneering trees) which can grow faster than the weeds. If you plant the slow growing ones first, the super fast weeds will kill them. Make sure that your tall trees with lush foliage are not planted where the morning sun comes in. The tall trees like Cupang and Anabiong are fast growing and the foliage are well distributed, the sun can still shiine through. They combat the weeds and they still allow vegetation to grow under (shrubs and plants). The Balitbitan is an ornamental shade tree with a huge crown. (don’t plant them close to each other) You can visit UPD or UPLB to see them so beautiful now). The young leaves are white like hankies hanging. You can put it in an area where you want to have a picnic table or a hammock under it. Plant the Lauans and similar hardwoods (dipterocarps) when you have arrested the soil. The leaf litters of the fast growing ones will prepare the soil and provide the shade for the slow growing ones. The Taluto is a fast growing, short lived giant tree. (that’s ok since it grows fast anyway). It sheds its leaves in season and is replaced with apple green flower/seeds which turn to brown after. Plant them in the perimeter area alternate with Cupang. Thank you Telyd! I will keep you pointers in mind when we start planting. 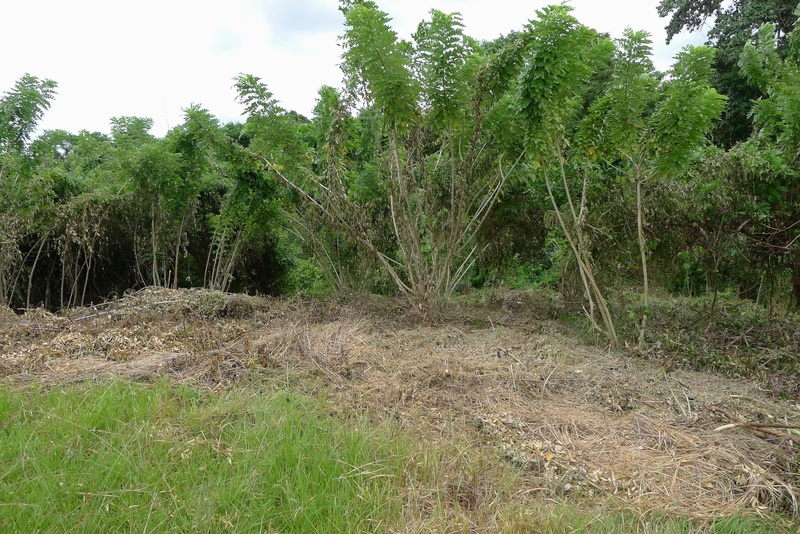 We cleared off the suag kabayo from the planting area first. There was so much, it was hard to see where to put the saplings. Then, planning to keep weeding and also mulching to control the weeds. Hi Kat, I don’t sell seedlings. If you like, I can ask my friend who sells to contact you. Just send me your email. Hi Sylvia! Thank you for coming up with such an informative blog. I’m inspired to document my efforts as well. Hi Audi, thanks for visiting my blog! Please send me a link if you post online about your farm. I’d love to read it. I think it’s a great to put this info online to encourage others to do the same. And then one day we will have pockets of forest that can turn into green corridors! We are supposed to meet up with an Ayta expert on plants who has a nursery in Bataan. If it pushes through, I’ll let you know what he has and how to go about buying. Hi Ms. Sylvia! I am a student, and currently working on my research. I would be needing leaves of Lanete, and I am having a hard time on finding one. I know that you are into restoring trees but I wish to collect leaves in your farm if you would allow me to. This would be of great help to me and to my research. Thank you and God bless.